Here we are on the last day of July. Already. The Tour de France is done. The European tennis season is over. This coming weekend will see the famous chassé-croisé, the travel weekend when the juilletistes (the people who take their vacation in July) and the aoûtiens (the people who take their vacation in August) trade places. In other words, traffic is bad in both directions. 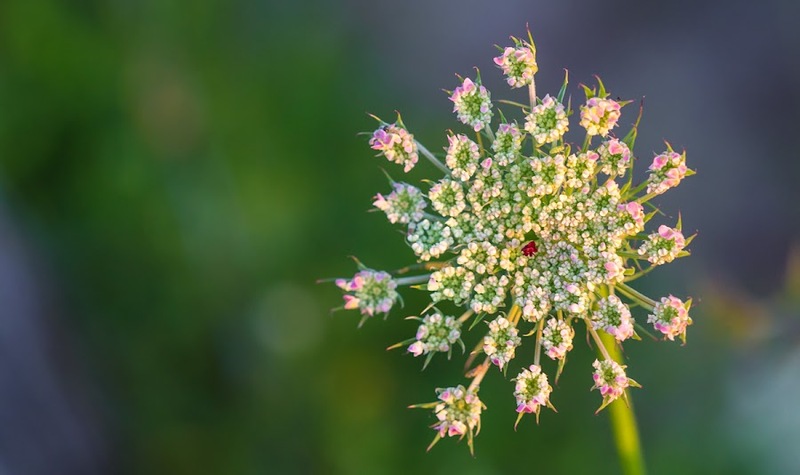 This is not wild carrot, but something else. Its flowers were yellow. We normally stay put this time of year. 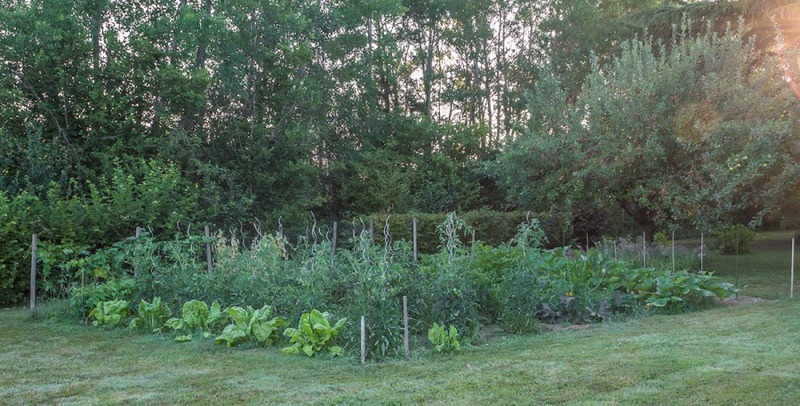 The vegetable garden needs looking after and the tomatoes will start ripening now. Yesterday, in fact, I spent a good part of the morning weeding, removing lower leaves, and banging in new stakes. The tomato plants get a little top-heavy as the fruit grows and their metal stakes start to lean, so I tie them to new stakes to keep them upright. I need to find a different way of supporting tomato plants. The internet, of course, is a source for many ideas, a few of which I'm considering for next year. I'll keep you "posted." Here's another view of a wild carrot flower (Queen Anne's Lace) in its seed-setting stage. The grape growers have been mowing around the edges of the vineyard parcels and between rows of vines over the past week or so. As a consequence, many of the big patches of wildflowers have been cut. There are still plenty out there, though. When the seeds form, the flower head curls in on itself. We spent a very nice afternoon at our neighbors' on Sunday. We saw a friend we haven't seen in a while. She's elderly and not doing great, but it was good to see her out and socializing. Lunch was sliced cold meats (roast beef and pork) and salads, including grated carrots, rice salad, tabbouleh, and heirloom tomatoes. Our neighbors' daughters and granddaughters seemed to be in charge of putting it all together. We left Tasha home alone (we were only across the street) and she did very well. Ken volunteered to drive our elderly friend home when she was ready. We got back to the house in time to watch a tennis match and the final leg of the Tour de France, both of which we had recorded while we were out. 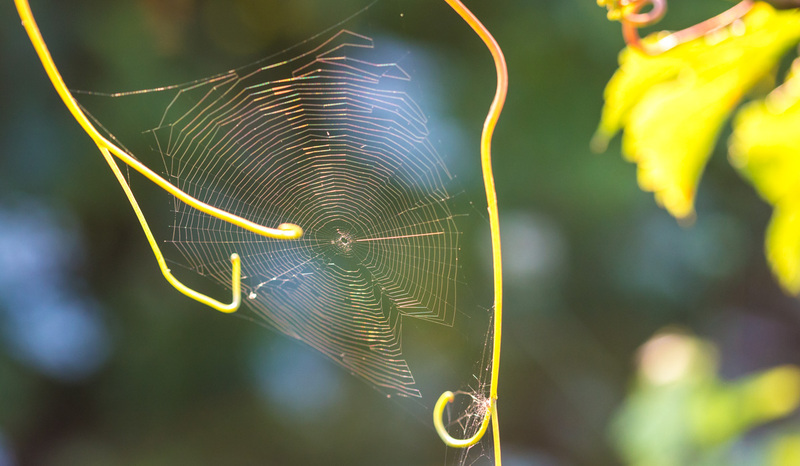 I spied this spider's web glinting in the morning sun the other day. It was built between a couple of grape vine tendrils out in the vineyard. Most webs are temporary structures, but this one seems particularly vulnerable to wind and weather. Those spiders are crafty little critters. I got outside early on Saturday morning and cut most of the grass. Not long after I finished, it started to rain. More like a heavy mist, actually. I measured zero accumulation in the rain gauge this morning. The full lunar eclipse started here last night around 21h30. I was just going to bed then. But I got up around eleven and noticed how dark it was outside. I thought, oh, it clouded over, but then I remembered the eclipse and went outside on the deck. There was the moon, mostly covered by the Earth's shadow. They come in all sizes and many variations in shape and color. This one has nice pink shades at the edges. I watched a while, then went back to bed. I was too sleepy to deal with getting the camera out to take photos. So you get a wild carrot flower instead. I saw this ad poster in town a few days ago and it made me chuckle, so I just had to get the camera and go back for a photo. 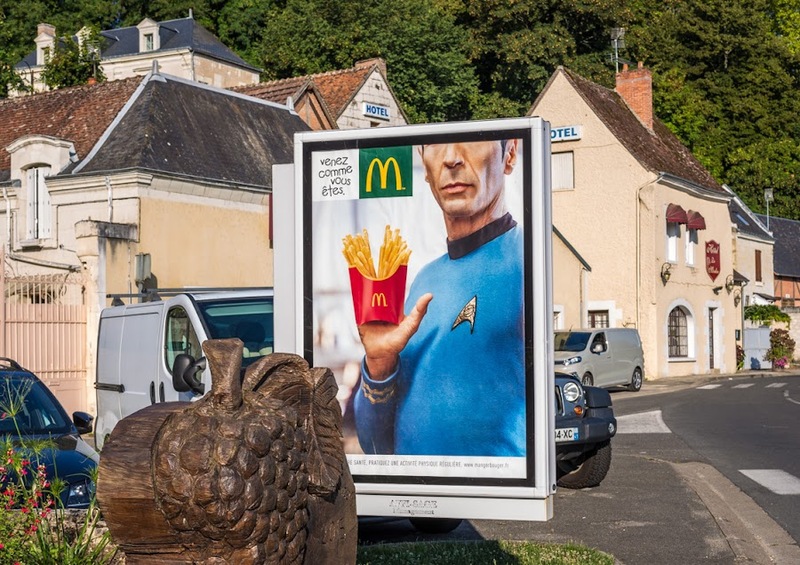 I wonder if this ad is all over the world, given the burger joint's coverage of the planet and the nearly universal (pun intended) recognition of Star Trek's Mr. Spock. As Mr. Spock would say, "Fascinating!" If you've seen this advertisement where you live, I'd appreciate knowing. I'm sure that those of you living on Vulcan have seen it already. It's hot. The kind of hot we're not really used to. Those of you who know desert climates or hot and humid coastal areas would laugh and maybe call us "snowflakes." You would love this weather we're having. We may be getting close to 90ºF today. 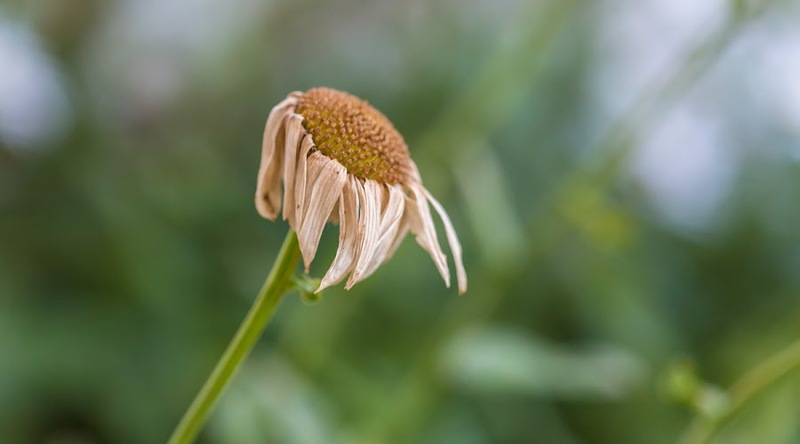 Our daisies are wilting in the summer heat. We don't have air conditioning, so what we do when it's hot is open all the windows very early in the morning to let the cool morning air flow into the house. In the afternoon, we close the west-facing shutters and windows to keep the heat out. When it's time for Tasha's afternoon walk, we start out with the best of intentions, but normally cut the walk short. It's too hot for a Shetland covered in thick fur. 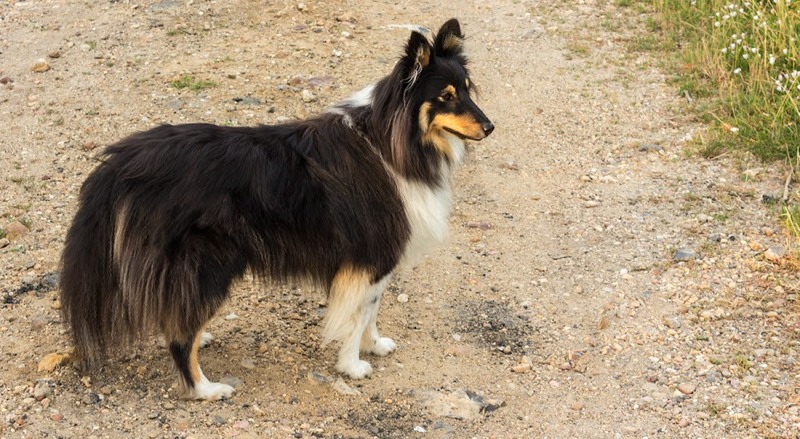 After all, Shetlands and collies were bred up in the northern reaches of England and Scotland where a heat wave is anything above 70ºF. And, apparently, they're having one now. So we hunker down and stay hydrated. 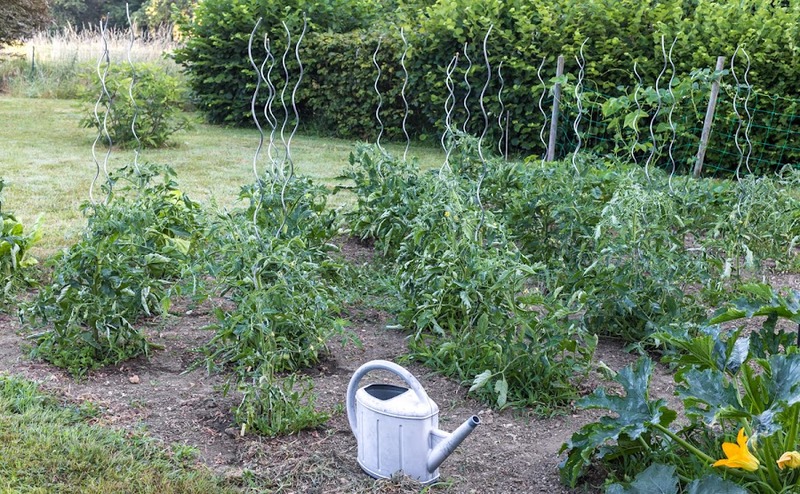 I water the vegetables and herb plants, but not much else. We may miss these "dog days" when they're gone. But September and October can be very pleasant and our hot summer will be but a memory. These are walnuts on the lone tree that grows along the vineyard road. The familiar wrinkled brown shell is inside this green casing which needs to be peeled off when the nuts mature in the fall. This tree doesn't produce an awful lot, and the walnuts it does make are often too small to be interesting. Still, that doesn't stop some of our neighbors from gathering a few from year to year. 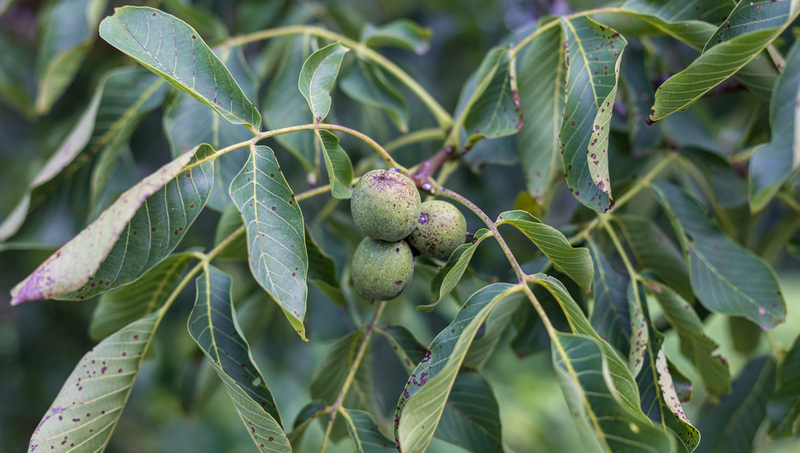 Although we don't have our own walnut tree, some friends of ours up river have one that produces so many nuts that they can give a lot of them away. We've benefited from their generosity over the years. In fact, I still have a whole basket full of their walnuts left from last year. The summer wildflowers are dominated, at least around here, by two varieties: wild chicory and wild carrot. 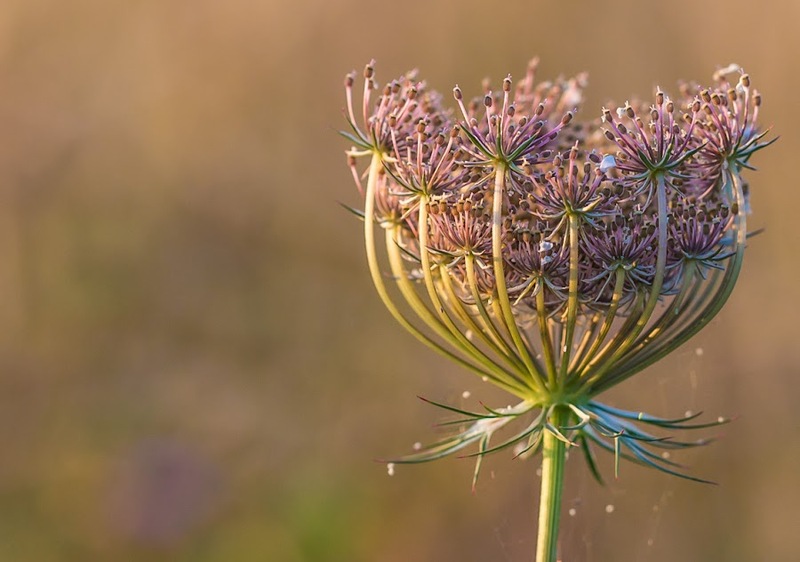 The carrot is commonly called Queen Anne's lace in North America. I've read that poison hemlock, another European native, looks quite similar. I'm going to have to look closely to see if I can tell the difference during my walks. 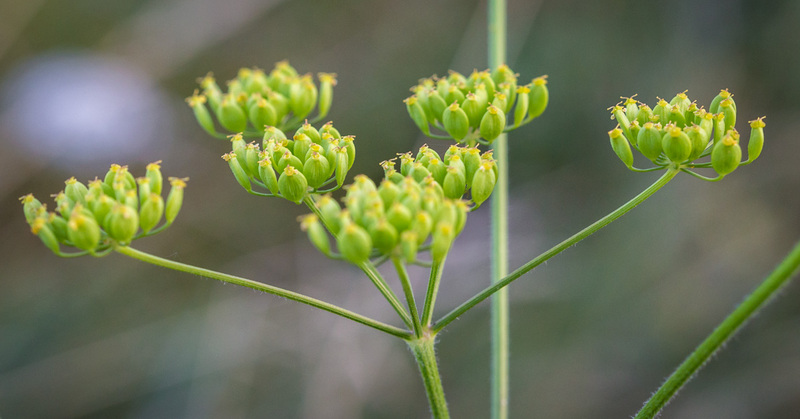 There seem to be several ombellifères (umbels) that grow wild around us. 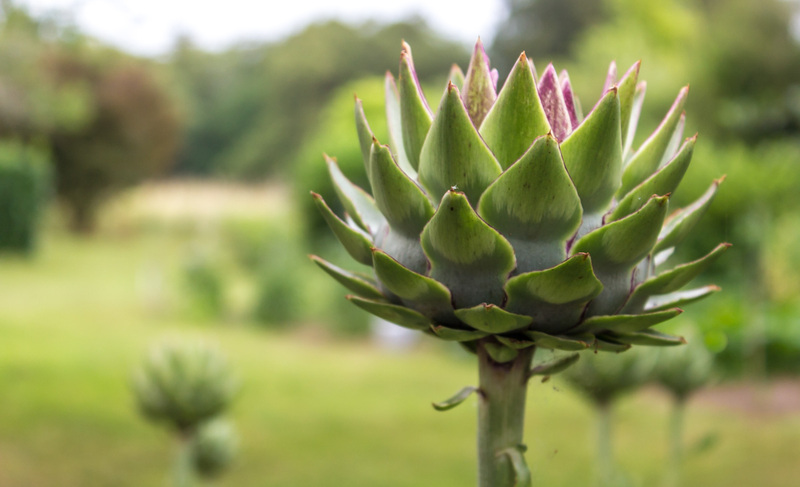 Well-known culinary umbels include celery, parsley, fennel, dill, coriander, and cumin. Prolific wild carrot growing among the grape vines. It reminds me of the mustard that grows in California's Napa Valley vineyards. 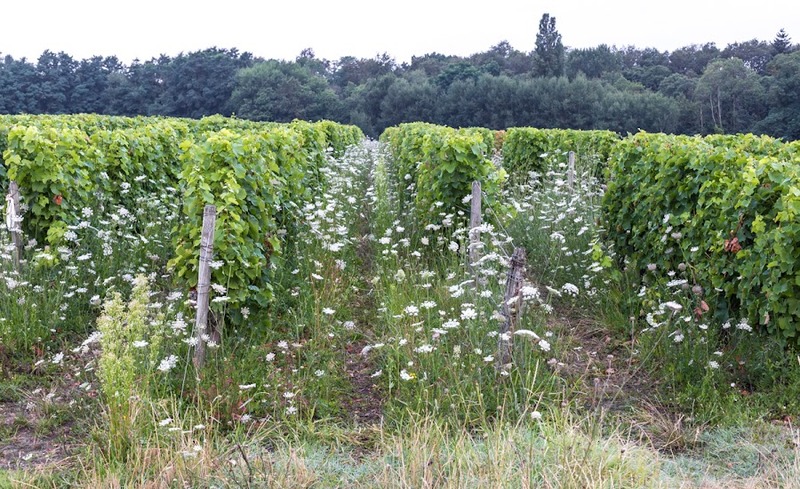 This year the grape growers around us don't seem to be as aggressively cutting down the weeds and wildflowers that grow among the vines. There is some mowing between rows, and a little plowing, but there are more carrot and chicory plants out there this year than I think I've seen before. I know that many growers in our region have abandoned chemical herbicides in favor of more organic methods of weed control, but one of the bigger operations near us has still been using them. Maybe that's changing. Ken and I have been thinking about how to deal with our current zucchini glut. He gave four more away to another neighbor yesterday. Today we plan to grate a couple of the squash and make zucchini fritters for lunch. I made a list of some other ways to eat zucchini that includes batter-fried, baked into a casserole with corn, stuffed, and broiled with garlic, spices, and cheese. The next few days will be like a zucchini-palooza. 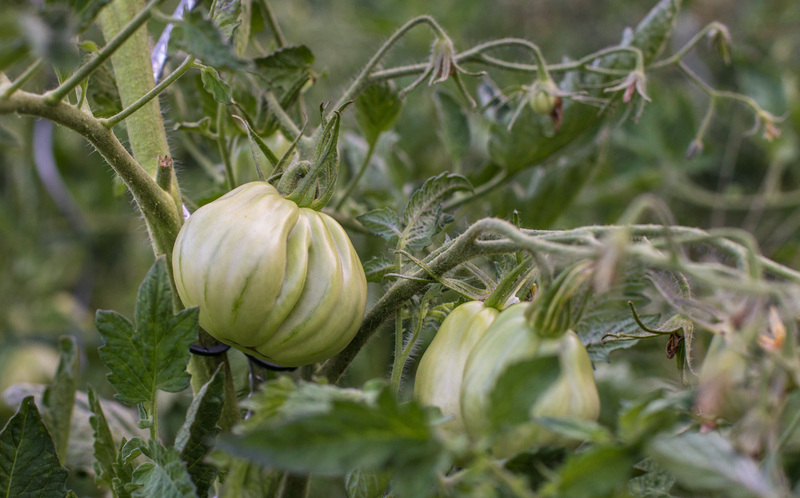 This variety of tomato is called corazón which, I believe, means "heart" in Spanish. It's shaped a little like a heart, and has distinctive ridges from top to bottom. And it's not the only heart in the garden. We also have cœur de bœuf (bull's heart) tomatoes. They are also heart-shaped, but with smooth skins, no ridges. I've grown those before, but this is the first time for the corazón. You have to imagine the heart shape. The point is at the top in these corazón tomatoes. The point is at the bottom in the other variety, cœur de bœuf. They'll start turning red soon, I hope. Ken and I were very productive yesterday, working to clean the utility room and also the drains under the house. The drains are working fine, but it's good to blast them clean once a year to keep them that way. Now we've got to put most of what we moved out of the utility room back in, and sort through what can go to the dump or to the recycle center. Summertime. We're enjoying the weather. It's often a little too uncomfortable for sleeping, but that comes with the territory. Last night was nice and cool. Our big rain from Thursday night will start the grass (and weeds) growing again, so I'll likely have to mow before too long. But I get a couple days off from watering the vegetable garden. The wild chicory is blooming all over the place now. There are a lot of chores to do, as well. We have to clean out our utility room, something we try to do once or twice a year. The floor gets gritty because that's where the animules enter the house and where Tasha gets cleaned up after a wet walk. I want to clean out the drains to keep them running freely, and we have a drain inspection next week to ensure that there's no rainwater going into the sewer system. I have a dentist appointment and a stress test in a few weeks. The teeth need cleaning and I lost a filling, so that will have to be dealt with. The stress test is a follow-up to my recent visit to the cardiologist for a check-up. All is well, just routine, given my family history. And this weekend I'm cat sitting for a neighbor again. It's pretty easy, just letting the cat in and out of her house and making sure she's fed twice a day. 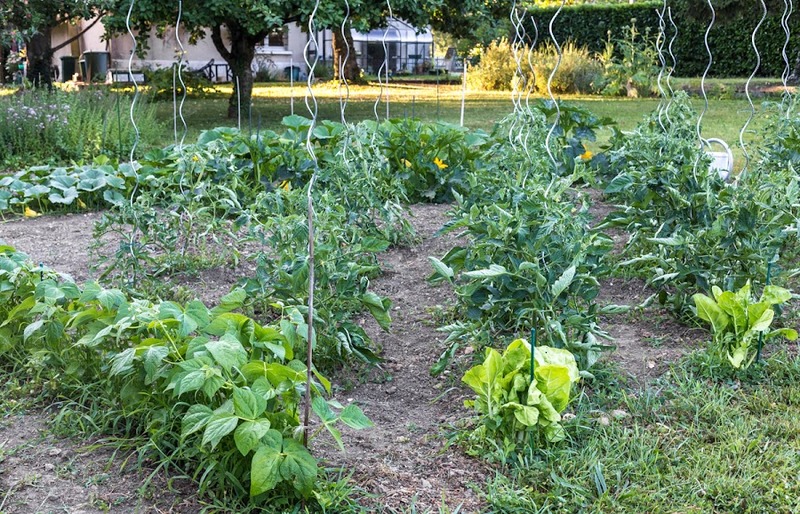 Otherwise, we're harvesting zucchini and beans from the garden, eating some and processing some for the freezer. The zucchini plants are in full swing right now. I've picked about two a day this week; this morning I picked five more. Yikes! We were able to give four away yesterday to neighbors. I've been grilling them, I've made a tabbouleh-style salad with some, we've baked some into a lasagna, made some ratatouille, stir-fries with zukes, and even made a zucchini pie. We'll likely make stuffed zucchini and zucchini fritters soon. I've blanched and frozen several of them to eat later in the year. There's plenty of Swiss chard in the garden, and the tomatoes are getting bigger. I picked a bunch of green beans yesterday. I guess that three plants are too many, even though there were three plants last year (plus a fourth if you count the lemon squash). Come to think of it, there is still some grated zucchini in the freezer from last year (zucchini bread!). Our day had two goals. The first was to see some of Versailles. As you've seen, we did. The second goal was to get Sue to Charles de Gaulle airport. She had a flight out to California the next day, and had made reservations for the night at an airport hotel. That worked out, too, but it was much less fun. 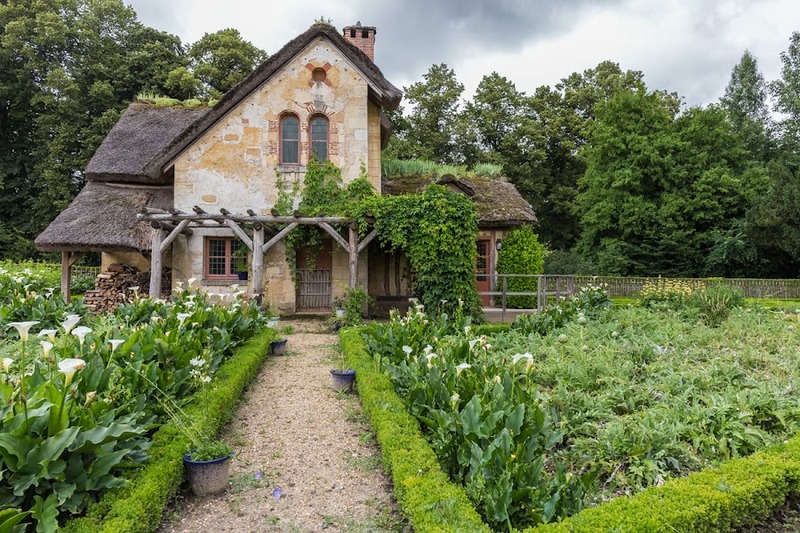 The gardener's house in Marie Antoinette's hamlet at Versailles. The problem was that the SNCF (the French national railway) was on strike. That meant that trains were not running normally. We decided to go to Versailles as part of driving Sue up to the Paris region because the regular direct trains from where we live to the airport were not running. Sue would have had to cross town to change trains in Paris with her luggage, not a good option. There was also a suburban train near Versailles that normally has a direct train through the city to the airport, but that wasn't running either, requiring another change in the city to get an airport train. And because the trains were on strike, driving around Paris from Versailles to the airport (and back for me) promised to be a traffic nightmare. The mill, with it's non-working water wheel. What I didn't know was that Orly is in the middle of a giant renovation. They're building two new train lines into the airport to connect it directly to central Paris. The main parking garage in front of the terminal was closed. Car traffic through the airport crawled. I asked a guy that was helping direct traffic what to do. He said to just park in the passenger drop-off area and leave the car briefly. It took a good fifteen minutes to crawl about a hundred yards to the drop-off area. I found a spot for the car and we went into the terminal. First we had to go downstairs to the arrivals level, where the bus stops are. Once we found the elevators (remember, we had luggage), they were out of order. An uniformed airport employee standing (and smiling) in front of the bank of three non-working elevators politely directed us to a second bank of elevators at the other end of the terminal. Once we found them, they too were out of order. All three of them. A clone of the first airport employee was standing in front of them as well. Smiling. So, we found a stair and, with a rush of adrenaline, I carried Sue's big bag down the stairs. I'm glad I didn't have to carry it up. We made our way toward where the bus stop was and along the way Sue spied the ticket machine. She bought her ticket without any problem and we went outside to the stop which was pretty much where it was supposed to be. According to the sign, the next bus to CDG airport would come by about a half-hour later. I got nervous about the car being parked in the passenger drop-off for so long, so I decided to move it while Sue waited for the bus. I told her: if I'm delayed, and the bus comes while I'm gone, get on it! We said our good-byes, but I assured her I'd be back, if only to make sure she wasn't still waiting or stranded. Well, getting around the airport took forever. Every parking area I found was either full or closed. I pulled into one open parking garage only to see, once I was at the entrance barrier, that it was for monthly subscribers only and, since I had no ticket, I had to back the car out. What fun! Traffic moved at a snail's pace. The time for Sue's bus to leave came and went (I actually saw the buses go by me on their way to terminal in the restricted bus-only lanes). When I made it back to the original passenger drop-off area, I parked the car again and went into the terminal, back to the stairs to change levels (no elevators, remember?) and hurried to the bus stop. No Sue. I assumed the bus came and she got on it as planned. The only thing to do now was to go home. I got out of the airport and on my way south on the autoroute. Traffic was heavy, but not too bad, and about two and a half hours later I was home. I decided to call Sue at her hotel to make sure she had made it. The hotel phone went unanswered for about a half-hour. I'd get voice mail, then after a minute or two of waiting, the line disconnected itself. Finally, I got a person on the line who told me that there was no Ms. N. at the hotel, and there was no reservation under her name. WTF? I verified my information and called back. When I finally got through again, the same woman scolded me, saying that she had already told me there was no Ms. N. at the hotel nor was there any reservation. I insisted that there was a reservation. She asked for the reservation number. I fumbled around but couldn't find it, so I hung up. Then, of course, I immediately found the reservation number. I called back once again and read the number to the lady at the desk and, presto! I heard Sue's voice say, "Hello?" She told me the bus arrived on time, the driver helped her with her bag, and they drove up to CDG without any hassles. She checked into the hotel and was settled in. Boy, was I relieved! All's well that ends well, eh? Sue and I didn't have time to spend at either of the Trianons. We made a bee-line to the hameau (hamlet) at the far end of the park. First, we took a walkway that led to the farm. The animals were all in their pens: cows, goats, sheep, and chickens. I read that the farm was restored to its original state between 1992 and 2006. Still, some of the buildings had sections of their roofs missing and some were protected by tarps. I wonder if they were damaged in the recent spring storms? The farm seen from across the cow pasture. There's a vineyard parcel just visible on the right. 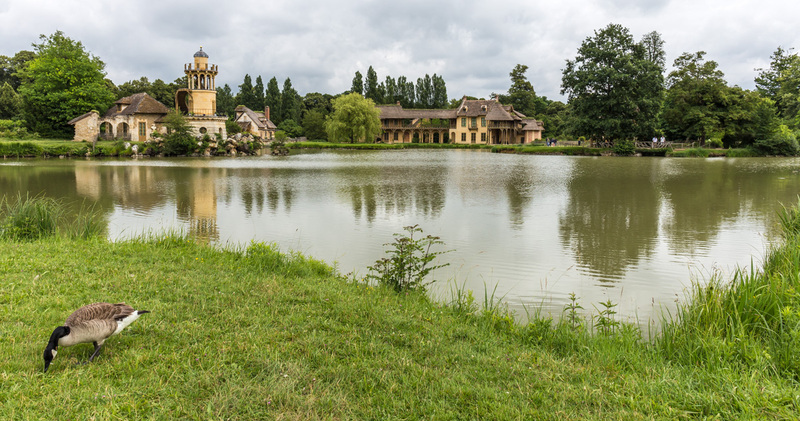 Next to the farm is the actual hamlet where Marie Antionette enjoyed time away from the château and her responsibilities as queen. 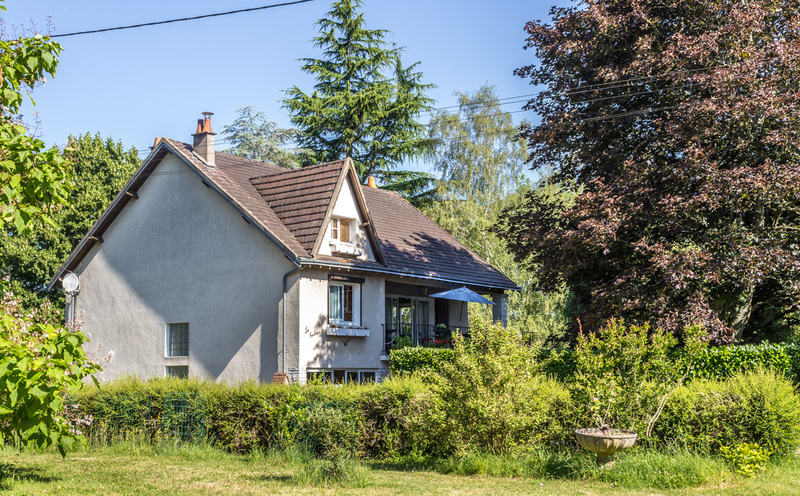 The buildings in the hamlet have just undergone a very thorough renovation. 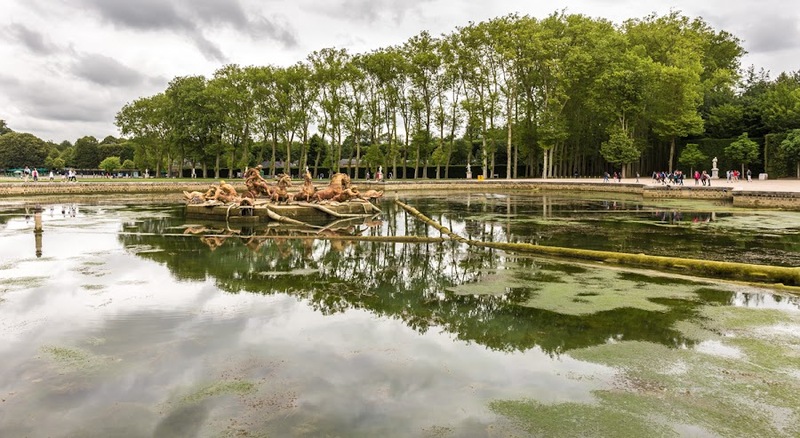 Ken and I saw a television program about the Petit Trianon and the hamlet just a few weeks ago that showed a little of the renovation, inside and outside of the buildings. I saw on the news the other day that the main house in the hamlet, called the queen's house, is getting its finishing touches, but the interior will only be open to guided tours. The hamlet itself from across the artificial lake, the queen's house is the building on the right. We spent some time walking around the impeccably maintained vegetable and flower gardens that surround the hamlet buildings. We saw the observation tower, the gardener's house, the dairy, the mill (with its fake water wheel), the queen's house, and others, all only from the outside. We could have spent a lot more time, but we were on a mission. I'll tell you about that tomorrow. It's hard for me to remember, exactly, my experience of Versailles in the early '80s. 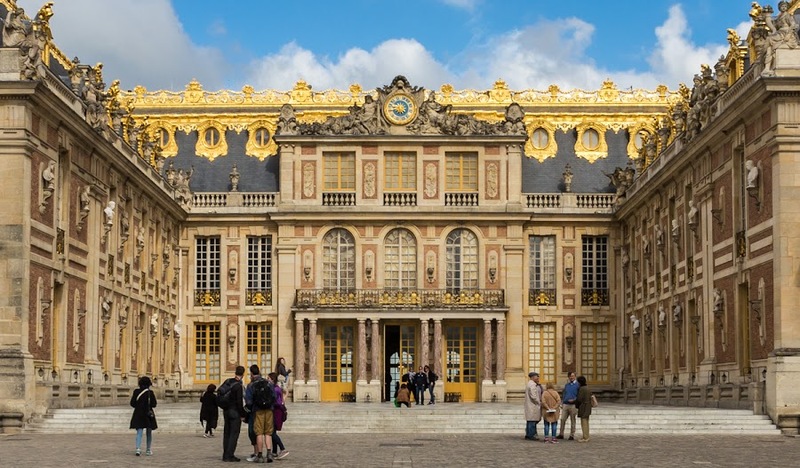 I didn't really have a grasp of the history of the place, apart from it starting out as the hunting lodge of Louis XIII and being transformed into the seat of French government by Louis XIV. Bits and pieces of my first visit come back to me, but probably what made the most impression was the size and scale of the domain. 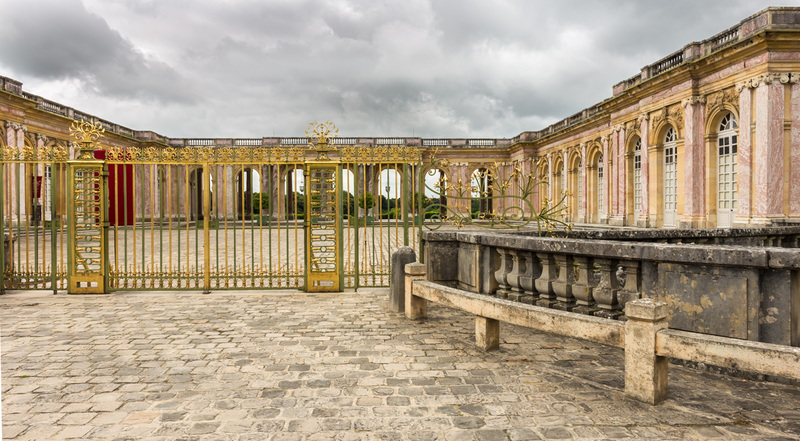 The entrance courtyard at the Grand Trianon. We didn't go in, just looked from outside. I was surprised last month to learn the château and the Trianon complex have their own entrance fees as if they're separate attractions. So, when Sue and I decided to go see Marie Antoinette's hamlet, we had to get an additional ticket to enter. We also had to wait a while because the Trianons didn't open until noon. We walked from the entrance to the Petit Trianon over to the entrance to the Grand Trianon while we waited. We also decided to grab a bite before going in. There is a small restaurant at the entrance that offers pre-made sandwiches and salads. We enjoyed that! 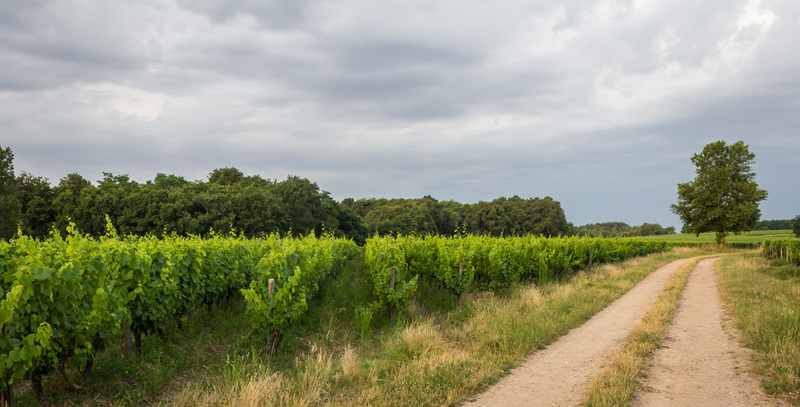 With the Grand Trianon at my back, this is the road that leads past the Petit Trianon and the hamlet. I also did not know what the word "Trianon" means. Apparently, there was once a village in the area called Trianon. That village was annexed into the domain of Versailles by Louis XIV and destroyed so the park could be expanded. All that remains is the name. 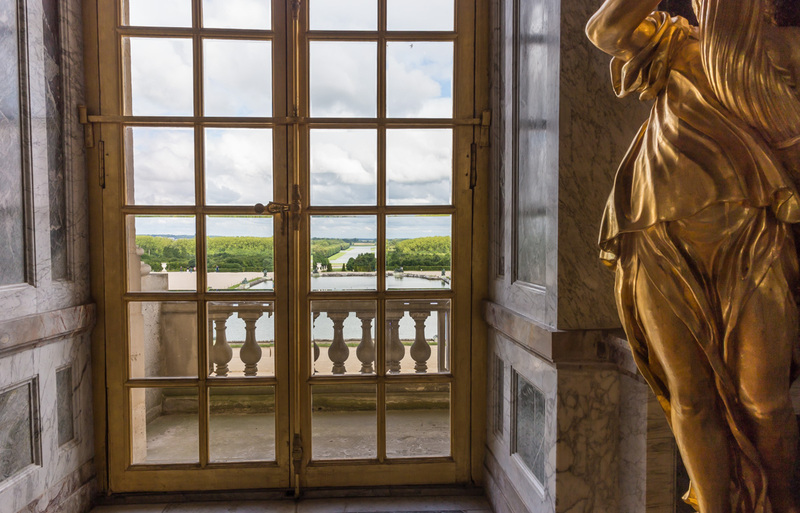 Views and perspectives are what it's all about in the park at Versailles. Grand tree-lined allées stretch in every direction, almost as far as the eye can see. Tall, immaculately trimmed hedges define pathways to and from the château. It would be interesting to see what it all looked like while it was being created, before the trees and hedges were mature. A glimpse of the château's north wing from out in the park. My friend Sue had a memory of seeing Marie Antoinette's hamlet, the queen's little fantasy escape from the exigencies of life in the royal court, and she wanted to see it again. We made our way through the allées toward the Trianon complex on the northern end of the park. The Grand Trianon was the retreat of the king. Nearby is the Petit Trianon, a refuge for the queen. There, Marie Antoinette (wife of King Louis XVI at the time of the French Revolution) remade this section of Versailles as her own personal space, a place where she could leave the rigors of court life behind and relax with her small circle of closest and most trusted friends. 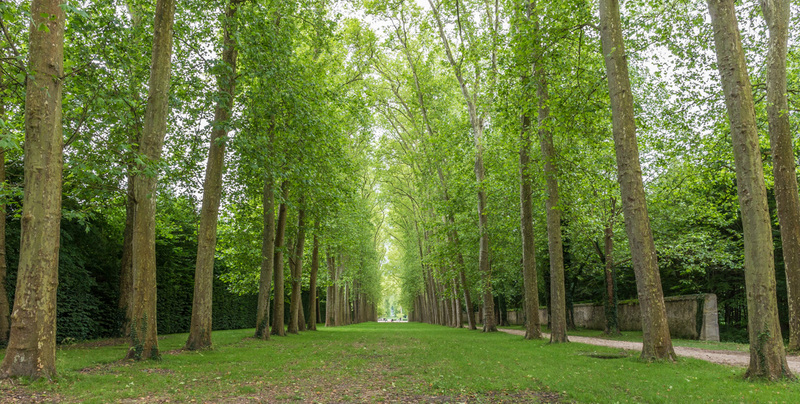 A tree-lined allée. We had to turn around at the end because the path from here to the Trianon complex was closed off. She had the royal greenhouses destroyed and built an English style garden in their place. She built a small theater where she could play-act on stage. She also had a small farm constructed, complete with livestock and vegetable gardens. 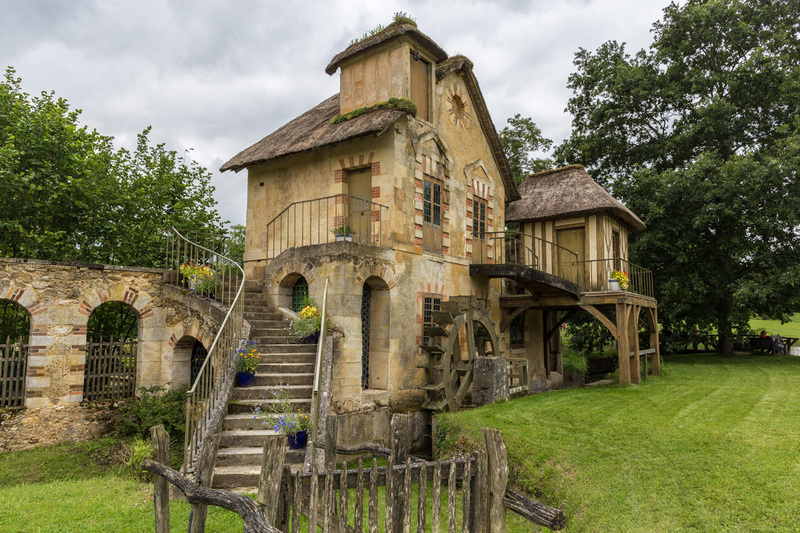 Next to the farm she built her hameau (hamlet), a fairy tale village where she could pretend to a peaceful peasant life, albeit a very luxurious one. More about that in the next post. King Louis XIV identified himself as the Roi Soleil (the Sun King) and likened himself to the legend of the Greek god Apollo as the Sun God. References to Apollo appear in many of the paintings and statuary at Versailles. Inside the château, the king's throne room was called the Salon d'Apollon (the Apollo Room). The Apollo Fountain, looking east toward the château in the distance. At the other end of the green lawn is the fountain of Leto, Apollo's mother, from yesterday's post. The Bassin d'Apollon (The Apollo Fountain), depicts Apollo as the Sun God, rising up out of the water on his chariot, like the sun rising each day over the earth. And, by extension, as King Louis XIV rose each day to provide life and leadership to his kingdom. And beyond! The almost-drained basin, pipes exposed, and the gilded statue of Apollo, his chariot, and horses, in the center. The day we visited, the fountain had been drained for maintenance. We could see some of the lead piping that supplies water to the fountain's jets and a crew working on one side of the basin as water was being pumped back in. We also saw a few mother ducks feeding their ducklings in the basin's deeper section. I didn't take a photo of the entire western façade of the Château de Versailles, apparently. But I got most of it in this image of one of the statues just outside. The statue depicts the Rhône River as an old man, reclined on the spring that becomes the river. 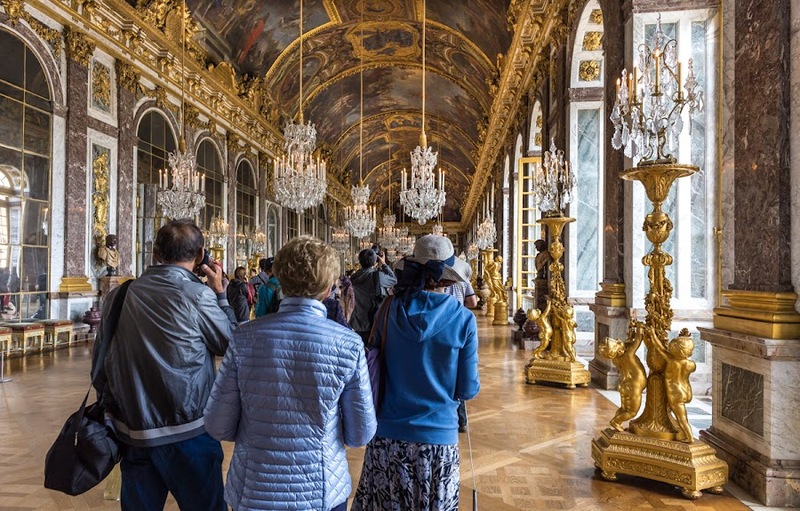 There are eight bronze statues, four on each of the two grand basins below the galerie des Glaces (Hall of Mirrors), commemorating the major rivers of France. The château's North Wing on the left, the Central Wing and the galerie des Glaces in the middle, and the South Wing on the right. As I stood there preparing to take the picture, another visitor was taking a photo in the opposite direction. Without looking around her, she kept backing up and moving right between me and the statue. I shifted a couple of times, but she kept moving into my shot, even after she noticed that I was trying to take a picture. So I deliberately crossed her path just as she snapped a photo. Not very civilized of me, I know, but it felt good and nobody got hurt. There's always construction going on somewhere. That's a good thing in that monuments like this are being preserved and cared for. The down side is that sometimes what you want to see is temporarily closed, or stunning views are obscured by scaffolding. Such is life. We saw many workers in the gardens cleaning up after some heavy damaging rains that fell just a few days before our visit. The part of the building on the left in this shot is the south façade of the château's central wing. It's the location, on the main floor, of the queen's apartments, which were closed for renovation. You can see the construction barriers and the scaffolding on the outside of the building. The palace's south wing is on the right, stretching toward me. The galerie des Batailles (Hall of Battles) is behind the big windows on the main (middle) floor and runs just about the entire length of the wing. Behind where I'm standing is the orangerie from yesterday's post. 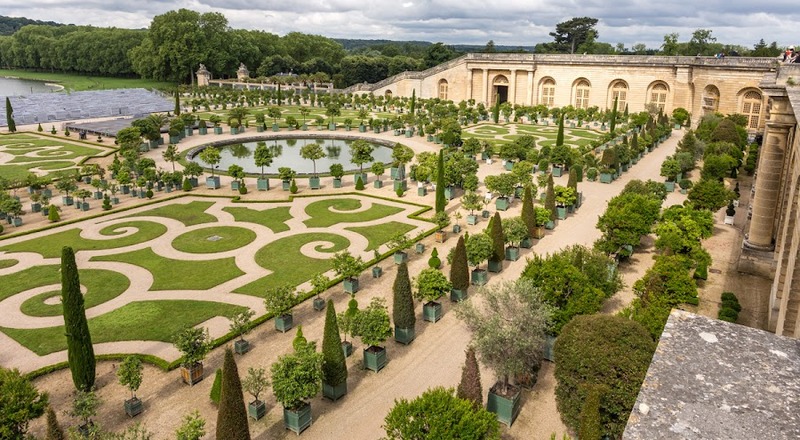 A feature of most grand châteaux in France (and probably Europe in general) is the orangerie, a protected indoor space for storing orange, other citrus, and other cold-sensitive trees and plants during winter. An orangerie is not a greenhouse, but is a much larger building that can accommodate tall trees such as palms. Citrus and palms were planted in large containers, taken outside during the summer, and brought back indoors for the winter. Workers were assembling a stage and bleachers on the southern edge (left) of the garden for some kind of summer show. The orangerie at Versailles is built beneath the south parterre. The main windows face south, but there are side galleries as well. The exterior space enclosed by the orangerie's window walls is where the trees spend the summer. I didn't have the time on this visit to thoroughly explore the orangerie's garden (guided tours of the interior are available by appointment), but I did admire it from the terrace above and snapped this photo from there. 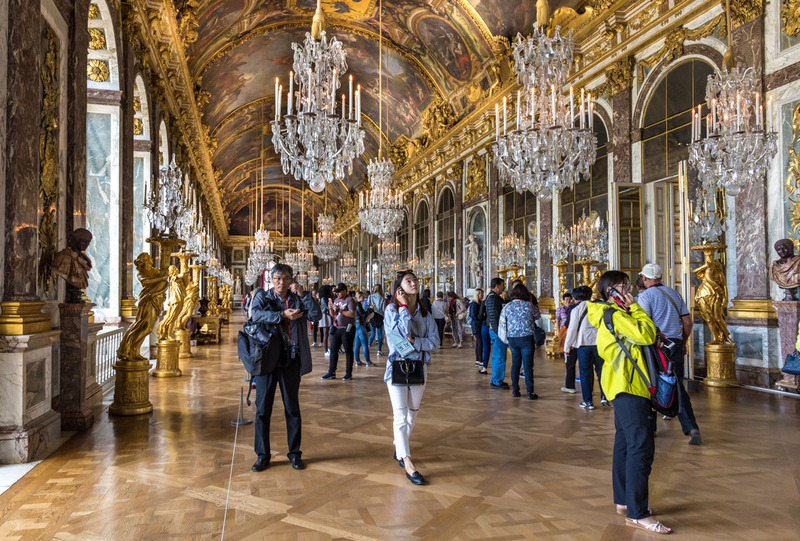 When we left the galerie des Glaces (Hall of Mirrors), the signs led us into a series of three rooms on the eastern side of the château's main wing. These were the official rooms of King Louis XIV. His office, where he met with ministers, his official bedroom (at the exact center of the château overlooking the Marble Courtyard) where the "waking up" and "going to bed" ceremonies took place, and a large antechamber, where people waited to view and participate in the morning and nighttime ceremonies. These rooms face east toward the rising sun. Immediately behind them, the galerie des Glaces faces west, toward the setting sun. View from inside the Hall of Mirrors toward the west, the gardens, park, and the Grand Canal. Next, after another antechamber and guard rooms, are the Queen's apartments that line the southern façade of the central wing of the château (the King's apartments line the northern façade). But they were undergoing renovation and we were directed instead through a series of small, empty rooms toward the galerie des Batailles (Hall of Battles), a grand hall that runs the length of the château's south wing, decorated with busts and large paintings of famous military victories. A grand stair led us back down to ground level and we exited out onto the southern parterre. It felt good be outdoors. The heart of the château around the Marble Courtyard. The three arched windows are in the king's bedchamber. The two windows to the right are in his office, the two to the left are in the second antechamber, more formally called le salon de l'Œil de Bœuf. I learned on this visit what is probably obvious to most others: the whole central body of the château, the ground floor and the two upper floors, was dedicated to the king and his family. Members of the royal court (numbered in the thousands) lived in the northern and southern wings and other nearby buildings. It must have been crowded for them. They probably longed for the much more spacious Louvre palace in central Paris. One of the most amazing rooms in the Château de Versailles is la galerie des Glaces (Hall of Mirrors). It runs nearly the entire width of the central wing of the château, its windows looking west over the park and the Grand Canal. On the eastern wall, the arched floor-to-ceiling windows are replicated with mirrors instead of glass, providing an abundance of light and a feeling of transparency to the room. Looking north to south, the mirrored wall is on the left. You may recall from your history lessons that the galerie des Glaces was the setting for the signing of the Treaty of Versailles in 1919, at the end of the first World War. Being among the most popular of rooms, visitors to the château enjoy lingering there and taking photographs. For those of us not privileged enough for a private visit, we have to expect a lot of people in our shots of the space. Still, the size of the room allowed the crowd to spread out a little, so that was nice. Looking back toward the north, the mirrored wall is on the right. The people who look like they're on the phone are listening to an audio description of what they're seeing. The room underwent a comprehensive renovation between 2004 and 2007 and it shows. Statuary and ceiling paintings were cleaned and restored, the parquet floor was entirely replaced, and the chandeliers were cleaned and updated with bulbs that resemble candle flames, among other restorations. I read that most of the mirrors in the hall date from the time of its construction (1678-1684). Many had been replaced with bad copies in the 19th century, but those were removed in the latest renovation. My friend Sue and I followed the crowd (like we had a choice!) through the Grands Appartements du Roi. 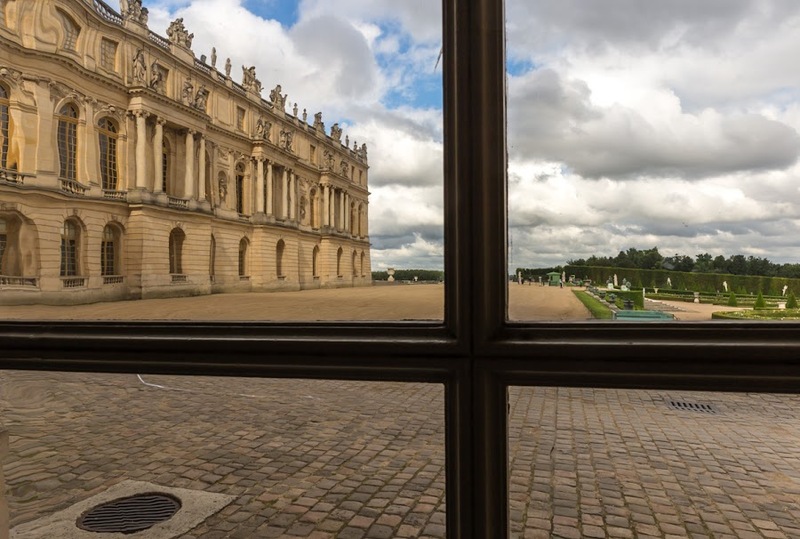 The rooms are arranged en enfilade, meaning that they are connected by doors, often and in this case along the exterior window-wall of a building, with no corridors to separate them. Hidden doors in the interior walls lead to passages and private rooms. Portrait de Louis XIV en costume de sacre, Hyacinthe Rigaud, 1701. This is a copy; the original is in the Louvre. These big rooms were official and public, where the King could be seen doing kingly things in a kingly setting. Behind them were smaller rooms, where the king ate privately, bathed, slept, and bedded courtisanes. Oh! Pass the smelling salts! 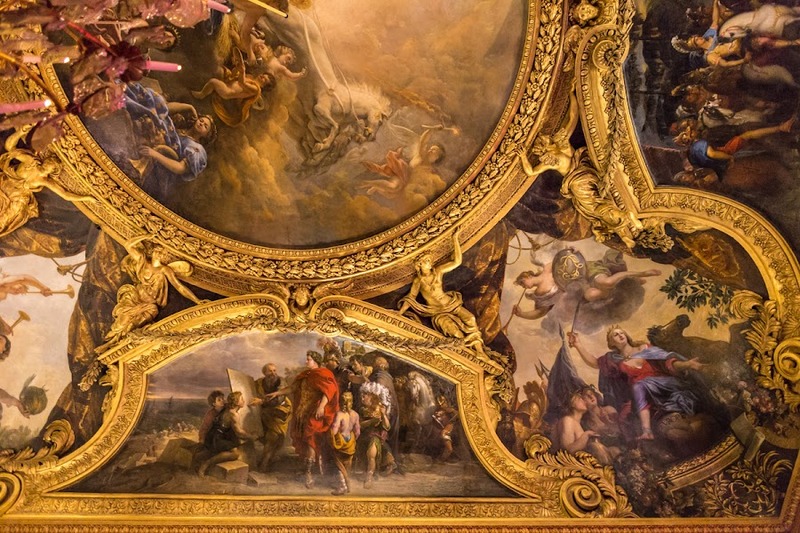 Part of the ornate ceiling of the throne room, formally known as the Salon d'Apollon. We saw no throne in the throne room, only a platform where it once was. However, two portraits faced each other from either wall. 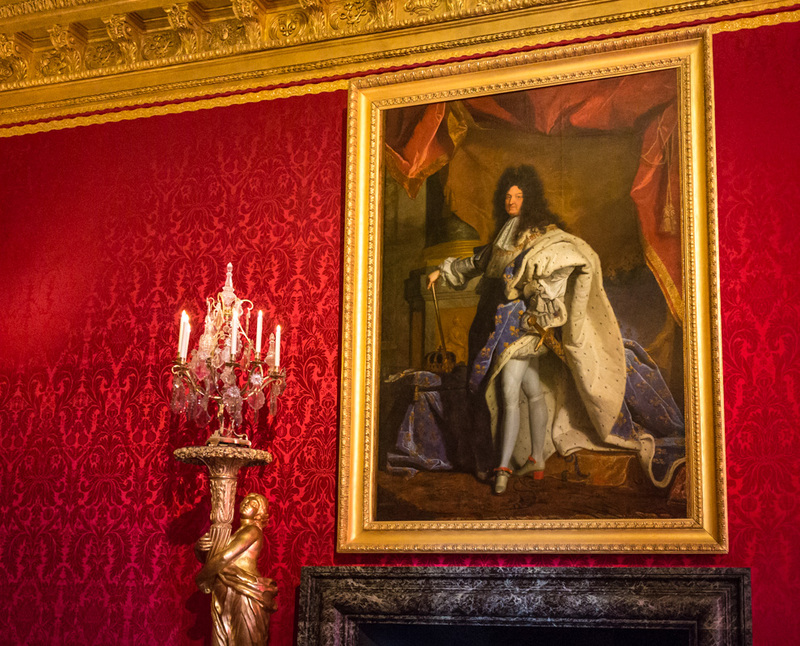 The one pictured here is of Louis XIV, king of France for over 72 years, the builder of Versailles. The other portrait (which I couldn't get a good shot of) is of Louis XVI, king of France for 15 1/2 years. His reign was cut short by the Revolution in 1789. His head was sliced off in 1793. These are the only photos I took in the Grands Appartements du Roi. The pressure of the crowd made photography challenging, to say the least. This view is taken from the ground floor of the north wing, looking through one of countless glass doors that I'm sure, at one time, provided palace residents direct access to the terraces and gardens around the château. The visible part of the building on the left contains the Appartements de Mesdames (Louis XV's daughters' rooms) on the ground floor, part of the Grands Appartements du Roi (the King's main rooms) on the main (middle) floor, and above, the Petits Appartements du Roi (the King's small rooms). The greenery outside the window on the right is part of the northern parterre. View of the main wing of the château looking west. The old glass in the door makes an interesting wavy effect. We followed the signs up a stair in the northern wing, then back in the direction we came, past the chapel, which is undergoing exterior renovation. We were not allowed into the chapel, but could look inside from an open door. The gallery of the closed chapel seen through a door on the château's main floor (one floor above ground level). Before we went up the stairs, I saw a corridor that led to what I later learned is an exhibit of the history of the building of Versailles, with models and drawings of the times. The corridor was roped off, so we couldn't go inside. Perhaps visitors need a special ticket for that, I didn't know. I would have enjoyed seeing that exhibit, but it was not to be. The corridor that leads to the history exhibit. It was closed, so no people in the shot! It was at this point, as we moved from the north wing back into the heart of the château and the apartments, that we started feeling crowded. A lot of people were being squeezed into a relatively narrow path through a series of smaller rooms. It seemed like everybody had a camera (us included) and everybody wanted to take photos of the same thing. And it was still early; the crowds had yet to swell to full size! 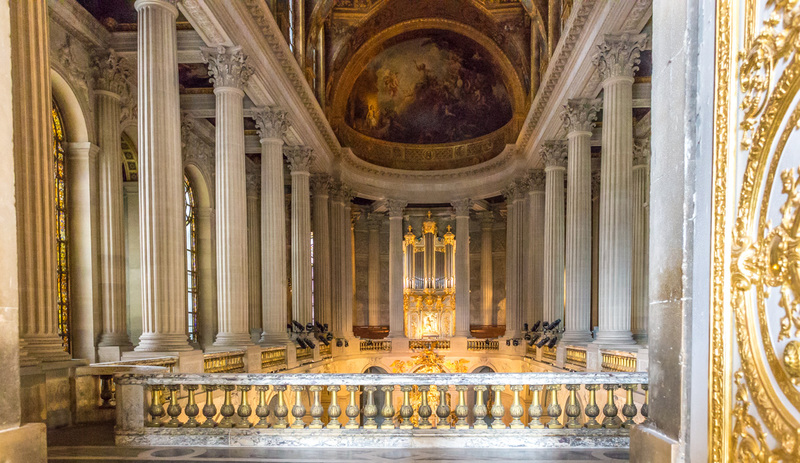 Last month, our visiting friend Sue and I drove up to the Château de Versailles outside of Paris. I hadn't been inside the château since 1981, and Sue's last visit was in 1975. Because of train strikes this spring, we decided to combine a visit to the château with getting Sue to Paris for her flight back to California the next day. I'll save the details of that adventure for a later post. We left our house at about seven in the morning and got to the parking lot at Versailles by 09h30. There was some morning rush-hour traffic to slog through as we got closer to Paris, but we still made good time over all. Standing in the Cour d'Honneur looking toward the center of the château. You can see, on the right, that the exterior of the chapel is under renovation. The screen that hides the scaffolding is decorated with a view of the chapel interior. It's a eye-catching effect. I didn't want to waste time looking for parking and walking a long way, so I planned to park in the main Place des Armes lot right in front of the château entrance and to pay whatever price they charged for the convenience. I found the lot with no trouble at all. There were something like 406 of 550 spots available, so no worries. We parked, had a little snack in the car, and then headed through the gate into the Cour d'Honneur toward the building entrance. I bought our tickets on the internet to save time, and the line for ticket-holders was not at all long. We were inside and through security pretty quickly. A closer view. Ticket holders enter on the left, under the "A." The gilded roofs, windows, and gates were quite impressive. Sue and I picked up a couple of maps and oriented ourselves. We also had to find the rest rooms. First things first! With that done, we began our visit. 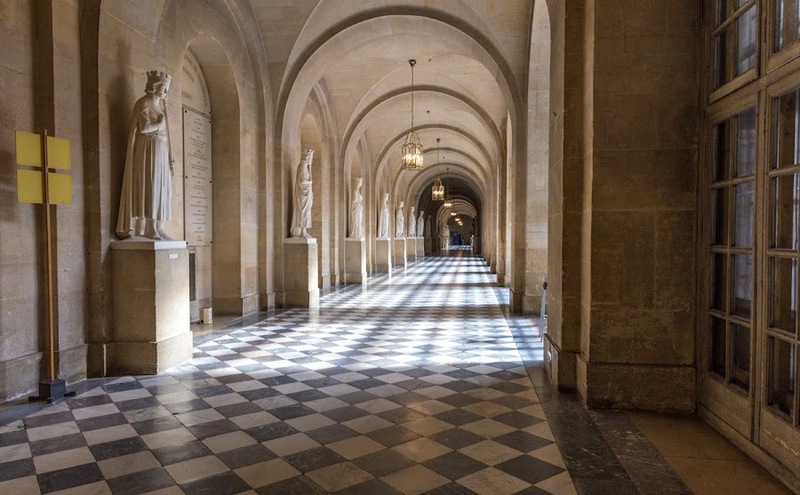 We exited the south wing (on the left in these photos) to cross the Cour Royale (The Royal Courtyard), passed the Cour de Marbre (The Marble Courtyard), and re-entered the building on the north side for a self-guided tour of a selection of rooms and galleries. Standing in the Cour Royale, looking toward the Cour de Marbre (up a few steps) and the château's historic ceremonial entrance. So many people were taking selfies with their phones and we saw a lot of people using "selfie sticks" which are not permitted inside. The grape crop this year looks like it will be abundant. 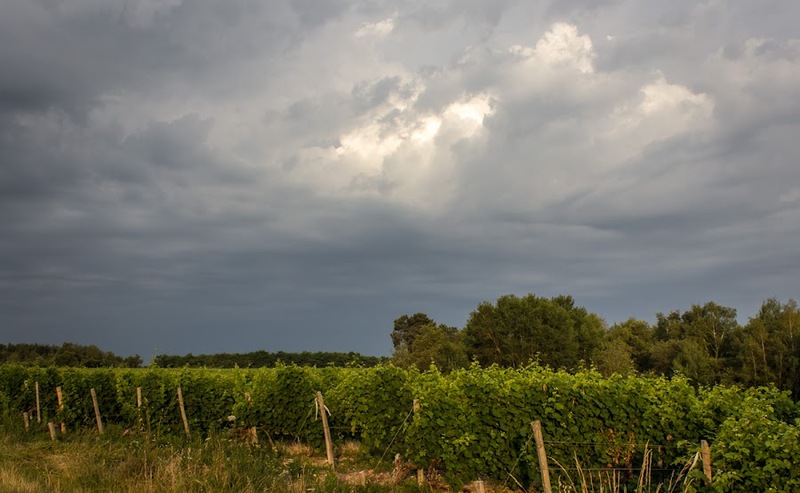 The vineyards around us are luxuriant, thanks to a very wet spring and warm weather. The vines seem to have rebounded from last year's April frost. Everywhere I look, the bunches of young grapes look bigger and more numerous than in recent years. Another shot taken with the old T3i (600D) and the 18-55mm zoom lens. 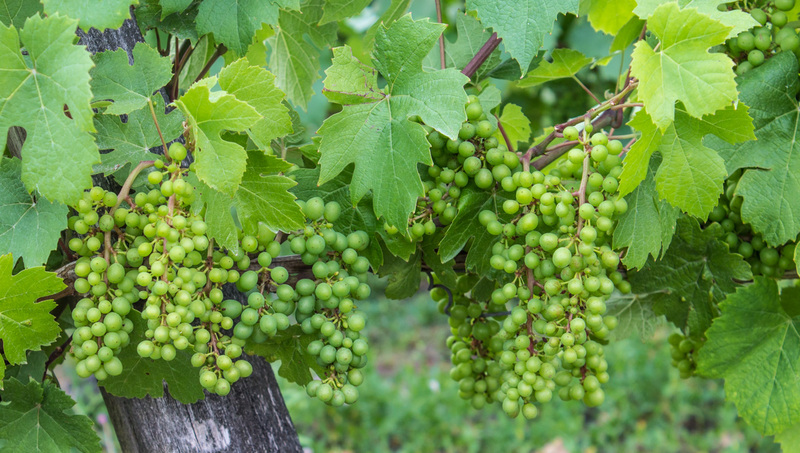 These are red grapes and will start showing their color later as summer progresses. July is here, Wimbledon is in full swing, as it were, and the Tour de France starts this weekend. And we're enjoying barbecue weather! Here's a shot from early Sunday morning as a storm moved in from the southwest. It was still far enough away not to threaten our vineyard walk, so Tasha and I were safe. This is another photo from my experiment with the T3i* and short zoom lens. The sun was still shining from behind me as the storm approached from the southwest. We only got about 4mm of rain from that storm, but then we had another on Monday that lasted for a few hours and dropped 15mm, just over half an inch, on us. The weeds are going to be happy. * By the way, the Cannon T3i is also known as the 600D. They use different model numbers in different countries, just to keep us on our toes. It's been a while, hasn't it? Tasha is now sixteen months old and is more or less full grown. She's left many of her puppy behaviors behind. For example, we've stopped using the leash on our vineyard walks. She knows the routes and where home is. Once in a while she'll see a deer or a rabbit and give chase, but not for very long and she usually comes back on her own. And she gets really excited about going for a ride in the car. Tasha needs a good brushing, especially around the hind quarters! I took this photo on Sunday in the batch of experiments with the older camera and lens. I like being able to zoom the frame to where I want it without physically moving. Can you tell I'm leaning toward shopping for a new zoom lens? The vegetable garden is doing well, so far. I planted fewer tomatoes than I have in past years. Still, there are twenty-five of them. Also three zucchinis, and three potimarrons (red kuri squash). I started them all from seeds in the greenhouse. 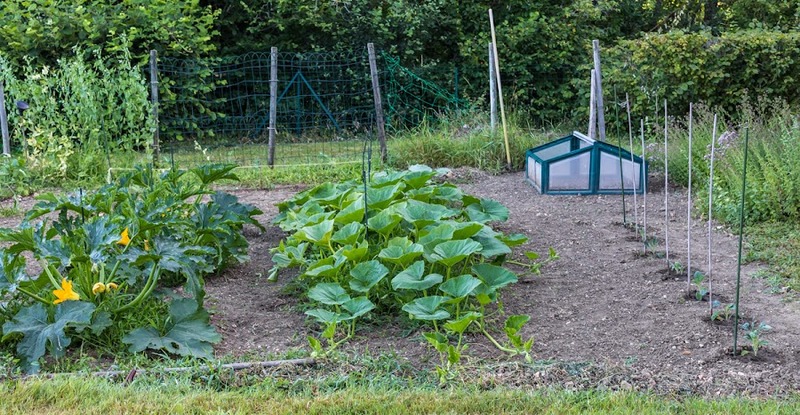 Zucchini on the left, potimarrons in the middle, and kale starting out on the right. I've got two rows of green beans going, too. And a row of kale that's just starting out. I've had bad luck with snow peas. The peas I planted don't seem to be snow peas, as the box says, but some other variety. Very disappointing. Green beans on the lower left. The bright green plants on the lower right are two of six Swiss chard plants. I also planted some climbing flat beans, but most of the seeds didn't germinate. I planted some more, and less than half of them came up. There are some beans now, but it's a very disappointing crop. However, the tomatoes look like they're doing great, and the Swiss chard is doing very well. Yesterday I went to the market for a few things. At one stand, I bought some radishes and a couple of red bell peppers. When I got home there were no red bell peppers in my bag! I had obviously forgotten to put them in. So I got back into the car and went back into town. The woman at the produce stand saw me approach, smiled, and held up my two bell peppers. We had a good laugh. So nice!